FREE Product On Site Assembly! The Spirit CR800 Recumbent Bike is the perfect bike for the commercial environment. The Spirit CR800 Recumbent Bike step-thru design makes it easy for your clients to get on the bike, and the easy-adjust seat allows them to find the most comfortable position. 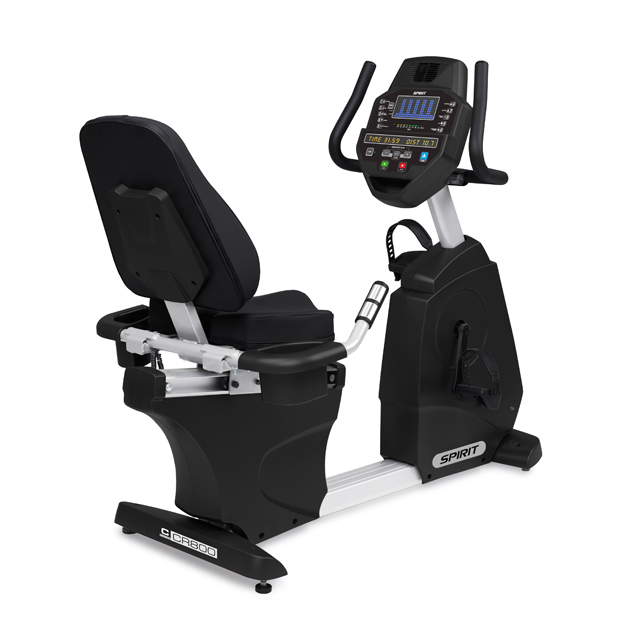 The Spirit CR800 Recumbent Bike console offers multiple programs, most with 40 levels of resistance and enough feedback information to make sure your clients never grow bored of the CR800. 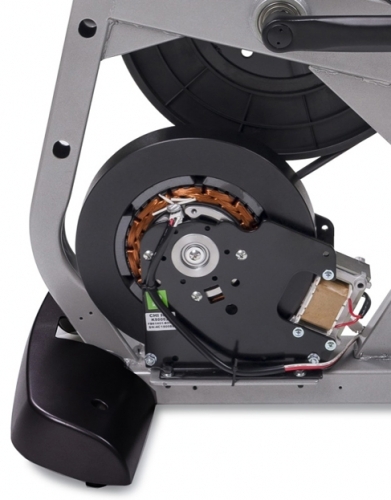 The extra-smooth ride comes from the perfect gearing and the integrated generator/flywheel system. It's all in the details. Step-up your cardio workout today and call 1-800-875-9145 to talk with one of our friendly agents at FitnessZone about the Spirit CR800 Recumbent Bike. Order your Spirit CR800 Recumbent Bike from FitnessZone.com today! and take your workout to a higher level. The entire C series expounds on two of these critical areas of comfort and convenience. We know that if you don't enjoy the experience that our products create, you won't feel compelled to make using them a part of of your lifestyle. The CR800 console is easy to use and full of easy-to-read motivational information. A quick touch of the fan button and your clients are being cooled by a turbo fan. Touch the upper, "Display" button to view the workout in either Track or Workout profile on the large LED matrix. There are ten different programs to keep the user motivated, from Heart Rate to Strength to Fat Burn; most have 40 resistance levels. The CR800 features a Fit Test program, or the user can simply push "Start" and begin their workout. A convenient cargo holder offers storage for cell phone or room keys. 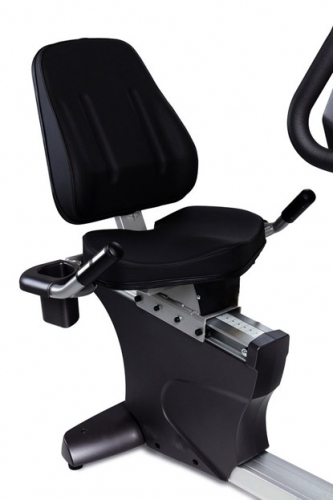 The CR800 console is also used on the CU800 Upright Bike and the CE800 Elliptical Trainer. This makes it easy for clients to vary their workouts on different machines and help them achieve their fitness goals. You can adjust the seat easily and intuitively by pulling up on the yellow spring loaded handle located directly in front of it..
Seat Comfort - The seat and backrest are made of high durometer foam pads. Generator System - A heavy duty 30 lb. flywheel results in more inertia (Revolutions per minute & Watt output). 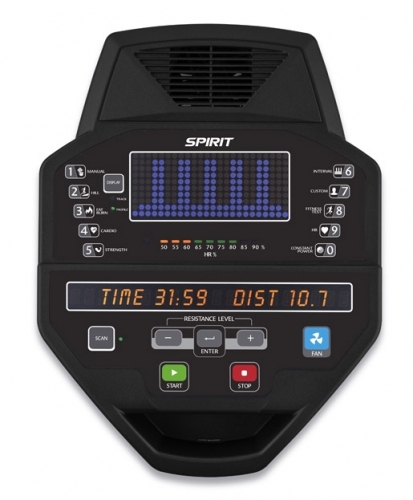 Order your Spirit CR800 Recumbent Bike from FitnessZone.com today! I have a bad back and 6.3 tall and weight over 250 lbs. This bike has been a life saver for me. It does not hurt my knees or back. FitnessZone helped me select this bike. I am glade I spent a little more to get it. Scott shipped it to my work in about 4 days. It took me around 1 hr. to assemble it. Give them at call if you want great service and fast shipping!